I Evgenia Howard (Vinogradova) was born on April 3, 1955 in the city of Tyumen - this is a big city in the center of Siberia, Russia. From childhood, I could see how my father could draw. He always dreamed that I would be an artist. In parallel with the general education school, I went to study in a children's art school. At the end of the general education school, my work began as an artist. 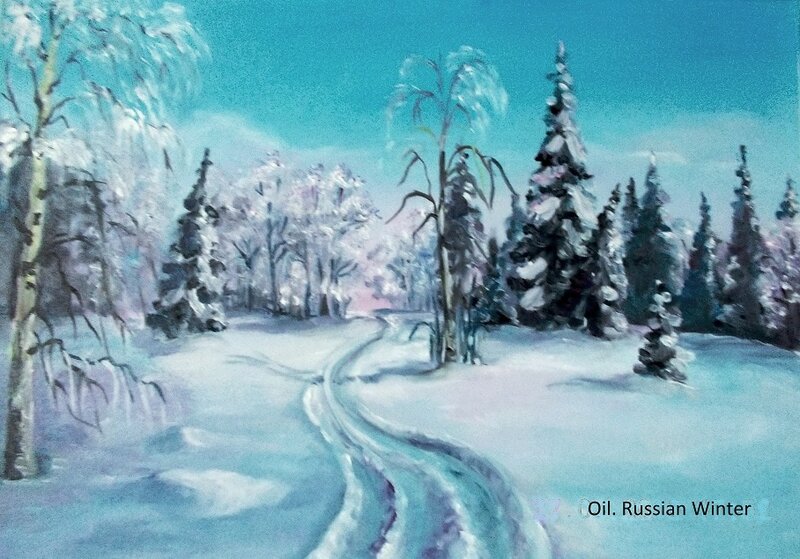 My whole life was connected with art, In my younger years, I worked in the "souvenir factory”, painting wood products. I worked in the theater as an artist - stage designer, made decorations for theatrical holidays. And I also worked as an advertising artist. For the last 15 years I worked in the technical school of railway transport, I made manuals for railway students. And all the work lessons and educational aids for the classrooms. I have always dealt with children, taught to draw and sculpt from clay and plasticine. I worked as a drawing teacher for 3 years in general school, and 4 years working with preschool children in the School of Early Aesthetic Development. I taught children how to draw, and mould from clay. I taught older children how to make dolls made of plastic and material. I have always raised my professional qualifications. I graduated from the training courses at the Architectural Institute and received the qualification "Architectural environment designer". and received the qualification "Artist - Advertising Producer". I graduated from the Pedagogical College, I also got a profession "teacher of preschool education". I attended a master class on making souvenir dolls made of plastic. I attended a master class on making ceramics. I have always been engaged in sewing and recently I learned how to sew patchwork bedspreads. For many years I did not seriously draw, because my work was connected with working on the computer and teaching children. But I always wanted to do serious drawing after retiring. In 2014, when I was on a visit to Australia, my future husband Robert Howard gave me a sewing machine and a box of paints and brushes. Since that time, I started to draw regularly and to making dolls of plastic and sewed clothes for them. October 15, 2016 was my wedding with Robert. I'm waiting to become a citizen of Australia and now I can freely engage in creativity. I want to improve and make progress in my creative work. I am very grateful to the Art Club of Seymour, which welcomed me and they organised my first exhibition of paintings and dolls. I hope that my participation in the Art Club will help me to progress with my work. And I hope that we will have a lot of joint work together and joint exhibitions in the future.